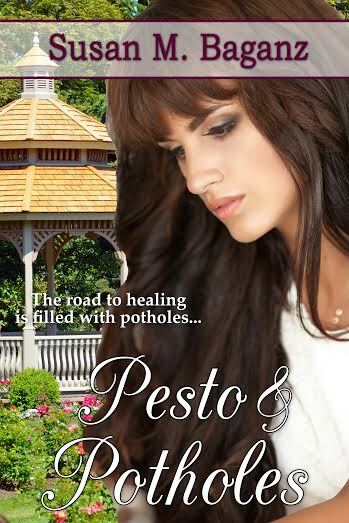 Renate Blake and Antonio (Tony) DeLuca are the main characters in Pesto and Potholes, an inspirational contemporary romance releasing April 24, 2015. We sat down the couple together to ask a few questions about the book and their journey. What did you think when you first met each other? Tony: I thought she was cute but she was definitely a mystery. So quiet and shy. I think if she could have hidden behind Stephanie she would have. Tony: And none come stranger than me. (he laughs). Renata: (playfully slapping his knee). In spite of all that, I thought he was cute. He had nice shoes. Tony: Shoes? Really? That’s what you remember from our first meeting? Renata: (shrugs) She asked . . .
Renata: Did we have a first date? Tony: I think that bonfire thing . . .
Renata: Oh. That. I’d rather not talk about it. Tony: Me either. I felt so horrible about that night. Renata: I wasn’t your fault. You really were my hero that night. When did you first kiss? Tony: (blushes) I don’t kiss and tell. I heard something about ninjas. What’s that about? Tony: She has hidden talents. Renata: You’ll have to read the book to find out. Renata: They are the difficulties in life we fall into. Sometimes it is deep pain we carry with us. Physically or emotionally and it can take time to get out of them and healing is not a straight upward trajectory, but can be kind of rocky. Tony: Mary Beth told you about that? Renate: Right. She was a huge blessing in helping me on my way. After all I had been through . . .
Tony: (grabs her hand). You’ve come a long way. Tell me about Orchard Hill Church. Renata: A community of imperfect people who are seeking God and filled with grace and forgiveness. Home. My new family. Tony: I think I had taken for granted all that Orchard Hill is since I’ve been attending a long time. Seeing it from Renata’s perspective though, I’m beyond blessed to be part of such a great church that’s willing to help people grow spiritually and emotionally to be all God has called them to be. It goes beyond Sunday morning into deeper relationships that take place at other times. I wouldn’t have been able to grow up like I have without my accountability group. Renata: I had been let down by “church” in the past and I’m grateful my roomie encouraged me to try again at Orchard Hill. It wasn’t easy but I’m so glad I stuck around. God is doing great things in the lives of people at this church. Renata: I don’t want to give spoilers away. Guess you’ll have to read Susan’s book. Tony: (grabs Renata’s hand). We’re in a good place now. I’m grateful for the journey God took us on. Renata: (leans over to kiss Tony’s cheek). Thanks for taking the time to be with us! Check out Pesto and Potholes for their full story.